Slash pine with “cat face” for harvesting naval stores. Photo by David Moorhead, courtesy of Bugwood.org. The 3,135-acre Olustee Experimental Forest (Olustee), located in northeast Florida was established in 1931. Part of the Osceola National Forest, the experimental forest served as the primary study site for a number of U.S. Forest Service Southern Research Station (SRS) units for almost 60 years. In the beginning, research on the Olustee focused mostly on naval stores, but the story of the Olustee is not complete without reference to Keith Dorman, who was sometimes called the Luther Burbank of forestry because of his pioneering efforts in the genetic improvement of southern pines. Dorman’s work, which spanned 40 years, enabled southern foresters to plant millions of acres of pines that grow faster, produce more wood, and are more resistant to disease. Dorman’s career with the Forest Service began on the Ottawa National Forest in the Upper Peninsula of Michigan. During World War II, he transferred to Florida, where the Southern Forest Experiment Station (predecessor to SRS) maintained a research unit in Lake City with field studies on the nearby Olustee. When Dorman arrived, “nearly every tree had a cat face,” indicating a history of tapping pine resin for naval stores. The term naval stores originally applied to the resin-based products used to waterproof wooden ships—turpentine, pitch, tar, and mask. The use of the term evolved to encompass all products derived from pine sap, including those used today to produce soap, paint varnish, lubricants, linoleum, and roofing materials. To tap for naval stores, workers first gash the tree with a curved blade to remove the bark, placing an angled piece of galvanized tin below the 8-inch long, 1-inch wide “streak” to funnel the sap into a rectangular collecting cup. Each new streak goes in above the last, which gradually creates a vertical “cat face” that can extend 3 to 7 feet up the tree. 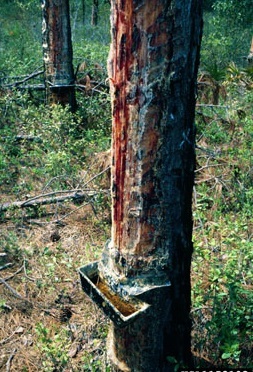 Dorman found a dozen trees that produced twice the resin as others and began breeding them. Within 5 years, groups of offspring from his selections grew twice as fast and produced twice the average resin yield, with individual trees producing four to five times the average. These successes prompted Dorman to become interested in selecting for other qualities. He selected seeds from loblolly, longleaf, slash, and shortleaf pines, and began a creative breeding program that was the first to show inherent variations in growth, limb formation, specific gravity, and resistance to diseases such as fusiform rust. Dorman’s work laid the foundation for the establishment of seed orchards throughout the South. One of Dorman’s 80 publications, The Genetics and Breeding of Southern Pines, is used as a text and reference book all over the world. Stands on the Olustee continue to be maintained for long-term studies and as a reservoir of genetic material for slash pine. Newer » Next post: The Interaction of Climate Change, Fire, and Forests in the U.S.